June 16th, 2013 – (Houston, TX). 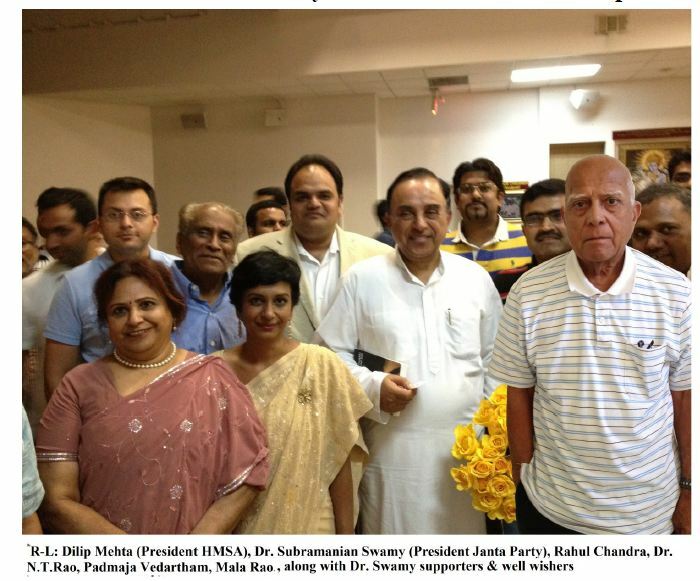 Dr. Subramanium Swamy visited Houston, Texas at ” INDIA AT THE CROSSROADS” presented by Hin-du Mahasabha of America (HMSA), Arsha Vidya Satsanga and hosted by Arya Samaj of Greater Hou-ston. The event was a success with 200+ persons in-cluding eminent Hindu community leaders presence. During his public address, Dr. Swamy informed audi-ence on contemporary trends impacting social, reli-gious and political dynamics in India. He mentions three negative trends and two positive trends that are under focus. One is rampant corruption which is un-dergoing in full push under the current UPA regime, scams like Coalgate, 2G and railways have impeded economic growth and there is prospective corruption set up in each and every central government deal. Re-garding foreign investments more focus is towards luxury goods production and investments for goods catering middle class and poor is less. Moreover cor-ruption fosters black money which is leading to seri-ous threat to India’s national security. With billion in black money which is being routed via Dubai via ha-wala brokers to international financial safe heavens, now since ISI and D–Company and has access to Du-bai financial systems Including hawala brokers, pri-vate financial data (account, amount and final destina-tion) of corrupt ministers is accessible to ISI and D– Company, as a result these politicians are fearful to speak openly and take stiff action against D– Compa-ny or ISI sponsored terrorism & other projects in In-dia, as they fear ISI will expose their black money data. Not only this but many of the 2G licenses (which were given at relatively heavy discounted price) to Indian firms, were later sold to foreign firms, some of which has ISI and Pakistani Muslims presence, for example the way Swan Telecom was later sold off UAE-based company Etisalat, whose majority board members are Pakistani Muslims. He emphasized fight against corruption has to be started from top execu-tives, top leadership at Central / State Government offices, if top leadership is corrupt free, downstream systems and process will fall in line. He says that people of India are smart enough to un-derstand the problem and culprits and will revert back with strong ballot support for NDA. On Sanjay Dutt court verdict he said that the court verdict should have been stiffer as supporting Islamic underworld which resulted in Mumbai bomb blasts which killed hun-dreds of Indian’s is heinous crime against nation. He believes in zero sympathy, zero tolerance political policy for tri problems of Islamic Terrorism, Maoism and Naxalism. Another negative trend he mentioned is that Indian society sole focus is becoming more mate-rialistic whereas under Hindu Vedic and Sanatan Dharma the materialist progress of an individual should be kept in balance with social welfare. This trend of having whole focus for material well off needs to be arrested and diluted. Another serious challenge is countering rapid conversions which is underwent in many eastern & southern states, work is underway to contain such conversion projects by pro Hindu forces. He states that Taliban considers India as unfinished chapter and is constantly conspiring to create havoc among Hindus and emphasized the strength of Hinduism who was able to sustain 200 years of Christian rule and 800 years of Islamic rule, still 80% India is Hindu in population. On Kashmir policy he states that not a single inch of Kashmir will be ever given to Pakistan and PoK is part of integral India. On Bangladeshi Muslim immigration he states that since 1/3 of Bangladeshis are in India, in that scenario 1/3 of Bangladesh land should also be integrated with India for equal adjustment or deportation of illegal Bangladeshi Muslims is recom-mended. But there are two favorable trends also, one is India’s growing young popu-lation which is talented, innovative and with good online education models and asso-ciated employment projects can educate and employ millions of young Indians, this will immensely help grow India. On agriculture he said that India is currently opti-mizing 33% of yield, India can optimize 100% yield as it can grow crops round the year and be a global leader in agriculture produce. He said China is running on ster-oids and prospective financial breakdown of Chinese economy is near in future. He is optimistic that India can have a growth rate of 12% and can be a developed nation by 2020 under good nationalist leadership. He requested Hindus to have a positive out-look for future and not loose hope but make correct move . He suggested ideology of keeping National interest should be above local and regional interest for the upcoming elections. India should check Chinese investments in Indian ocean area and foster good relations with Israel. For overseas Indians he suggested to support pro Hindu Organizations and work on projects that weakens political leaders who are corrupt and anti national. On question of some of Bollywood movies themes are targeted against Hinduism & Hindu Organizations, he said that’s an area of concern and should be carefully countered. On Narendra Modi he stressed that with an pro -agenda towards development, good governance and Hindutva —Narendra Modi led NDA victory is certain in next general elections.